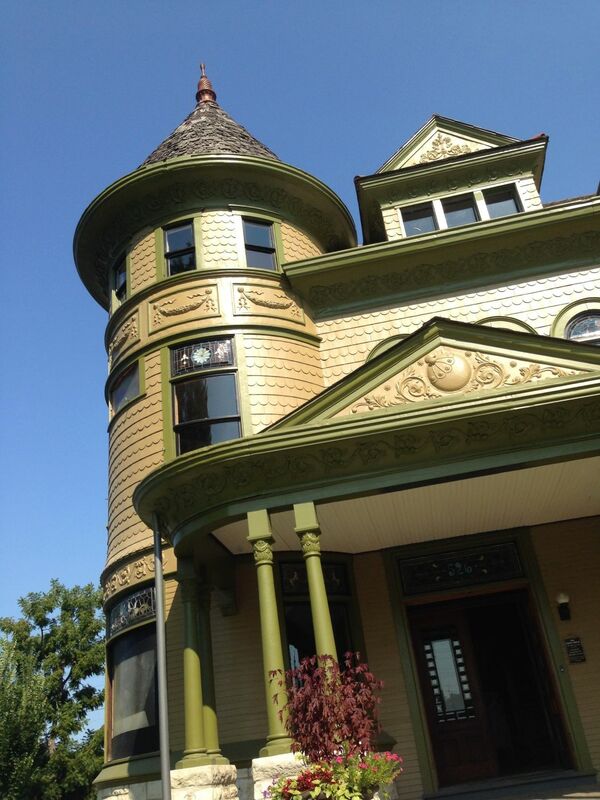 Today, we often think of Victorian-era houses as having many many colors, and all quite bright. However, this is the after-effect of the Painted Ladies craze which began in San Francisco in the 1970s. Wild & crazy hippies took old, unloved houses and painted them in exciting, bold colors, the more the better. 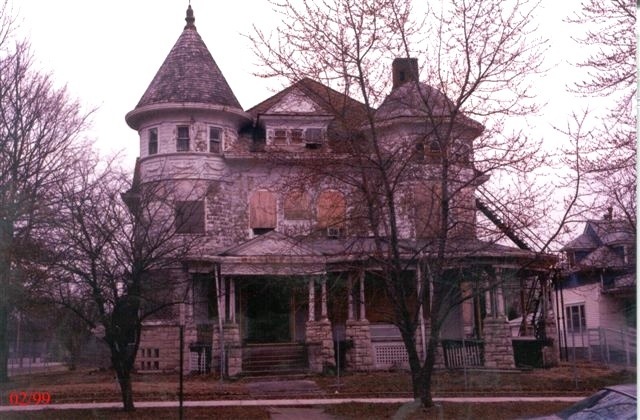 Images of these homes swept across the nation, and several books were published. But…this is not how houses looked in the Victorian era. 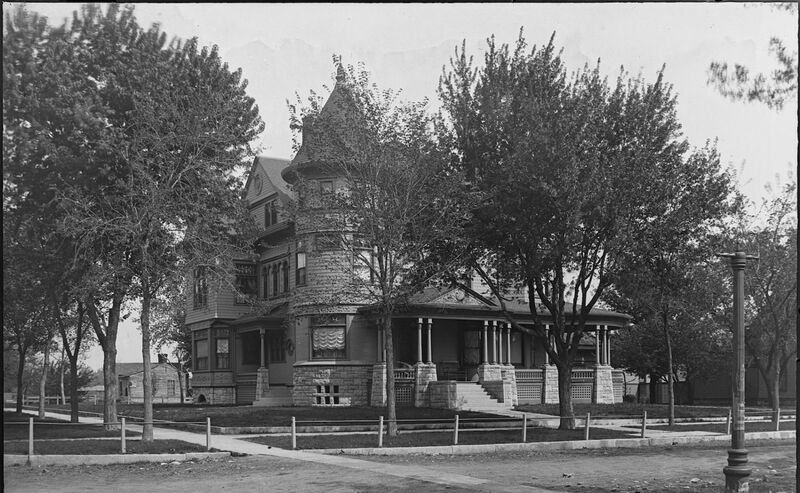 In the late 19th- and early 20th-centuries, houses were painted in subdued earth tones. White was never used, unless the house was, say, in the Greek-Revival style. Later, white became THE color for houses, and by the 1920s few Victorian-era homes remained untouched by this new fashion. This fate even befell the Cross House, and it remained white for another eighty years. 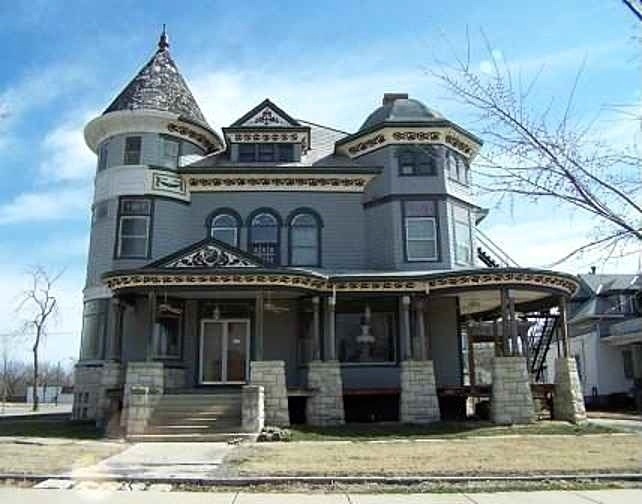 After being purchased by Debbi and Bob Rodak in 1999, Bob began the laborious task of removing a century of lead-based paint from the exterior. Bob then painted the main facade (west), and the highly visible north facade. The two other exterior facades were stripped of paint. The Rodak’s selected a blue-ish gray for the main color. They also picked out in a wine color the many stamped tin swirls which are a feature of the exterior. Although Bob’s work was expensive and laborious, it was never completed. Neither the west and north facades were entirely finished, and the east and south facades are still bare wood today. By the time I purchased the house in 2014, even Bob’s paint needed repainting. My guide was the 1895 image of the house. Encoded within was a wealth of information. While the black and white image could not convey color, it conveyed tone and other important clues. 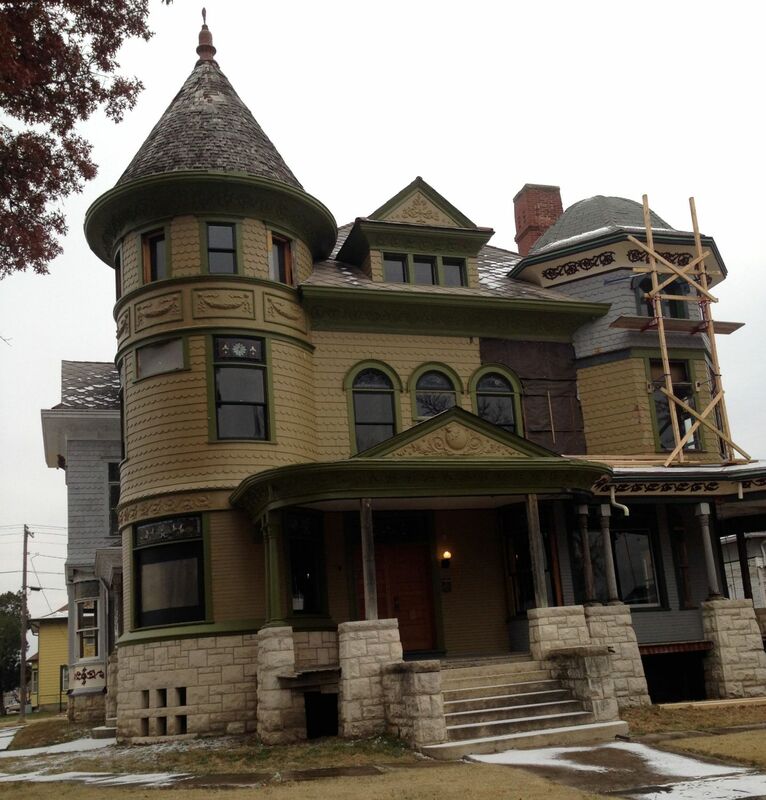 An 1895 article in the Emporia Gazette stated that the exterior was in several shades of olive. The window sashes were classic black. Even though Bob had removed the paint from the exterior, I found traces of the original colors tucked behind some shingles and trim, and these colors were, indeed, in several shades of olive. These traces were matched by Sherwin-Williams, and with the aid of the 1895 image I was able to ascertain what was Light and what was Dark. Originally, the tin swirls were painted the same color as the background they were attached to. After recreating this it became evident as to why the architect of the house, Charles W. Squires, chose this. With the swirls picked out, one’s eye is drawn to them, instead of the massing and overall effect of the house. It is like noticing jewelry worn by a woman, without noticing the beauty of the wearer. Unexpectedly, once some areas were painted in the historic colors, I and others were amazed at how good the gorgeous limestone foundation looked, and even the many stained-glass windows. The original colors complemented these important features, and the brilliance of the original architect was reaffirmed. 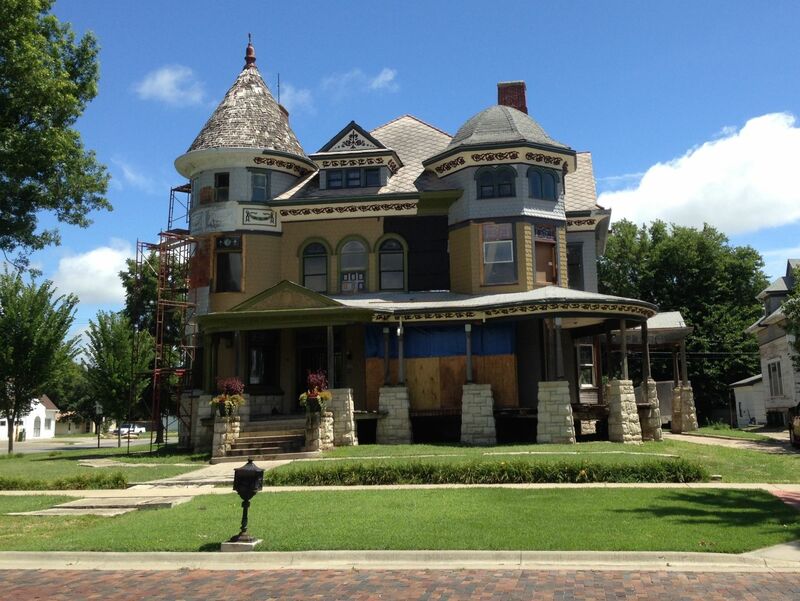 My goal is to have the main facade fully painted by the end of 2014, if the weather holds out. The other facades are scheduled for completion, I hope, by 2018. When this work is completed, the exterior of the Cross House will look like it did a century ago. The thought makes me tingle. NOTE: In the newer images below, the main porch is missing vital elements, such as columns, railings, and lattice. These will be discussed in later posts. 1894. The Cross House was brand new. Image: Walter Anderson Collection ESU Archives. 1999. The house at its low point. 2014, March. When I purchased the house. 2014, July. A work in progress. The original colors are slowly returning to the house. 2014, August. The tower. Painted!. 2014, November. The main (west) facade. Inching away! In 2017, I added some subtle accent colors. Hi Ross – I have followed your comments and posts on the Cross House through the Old House Dreams site. I try to visit OHD each day if I can. I am so very happy that you were able to realize a dream and become the next caretaker of the Cross House! The colors are going to be magnificent! I look forward to seeing more posts here as you bring this gorgeous lady back to life! Awwwwwww……..the color palette. Our home was polka dotted with so many quart samples………memories. i love your colors! Good job! We have 9 colors, but we were young and insane back then! Oh, we also experienced the lead poisoning with young children experience. Both of our kids are fine now. We had to have the neighboring kids tested as well. What a welcoming experience to new members of the community! Lol! Yes, we can laugh about it now. It’s beautiful Ross! I enjoy your posts on OHD and I’m excited to have found your personal blog. Ross, are you willing to share the Sherwin Williams paint colors that you have used for the house exterior? The colors were custom made by SW. They have no color name or number. What about sharing the color “recipe” and the SW base type of paint being used on the Cross house? The color choice is attractive! As I was stripping my pre-1900 Victorian, I was shocked to discover that the original paint color was a fairly bright yellow with black trim. Totally NOT the earth tones I was expecting. It was a spine tingling moment, since when choosing a color I kept coming back to a bright yellow in spite of all the color schemes I saw. I went a bit to the hippie child color scheme by going with a bright yellow with teal trim and splashes (corbels and trim on the porch column) of hot pink. Beautiful…. no more needs to be said! 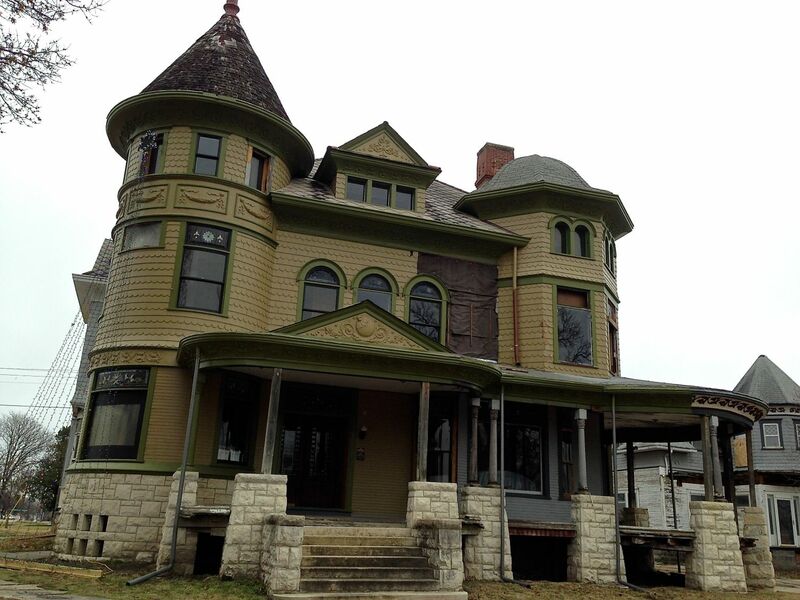 I have so many questions I need to ask you about restoring that house. Maybe someday I will meet you and take the tour of that home. Living in NM it might be tough to get there……! Hey Ross did you paint the exterior with a semi-gloss or ? It looks shinny and spectacular! Well done! 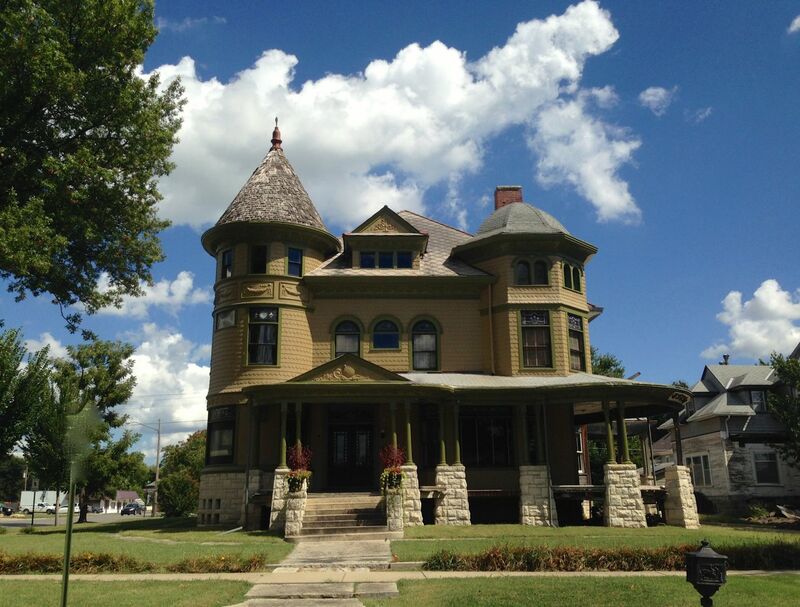 I cannot believe your luck – finding the original shades under some shingles and trim! And what beautiful colours they are!